Few tribute shows can claim to have a genuine rock star in its ranks. But the Mods & Rockers Show has just that in front man, Johnny Warman. Johnny was signed to Ringo Starr's record label, and had a string of hits in the 1970s and 1980s, including 'Screaming Jets', which featured Peter Gabriel. "As a youth in the 60s, one of the biggest decisions you could make was whether to be a mod or a rocker," said, Johnny Warman, frontman of the band. "As soon as I heard The Who, I knew I had to be a mod. But being so young, I couldn't afford a scooter or any of the sharp suits. I'd catch the bus to hang out with my friends in town." Johnny's musical passion began as a child. "I was walking home from school and passed a building where I heard music. I walked up to Dansette record player to find 'Love Me Do' by the Beatles playing. I was spellbound." In a happy twist of fate, Johnny later signed to Ringo Starr's record label and became the drummer's songwriting partner. Since then, Johnny Warman's Magic Bus has written and performed with many other top international artists, including Elton John, David Bowie, Peter Gabriel, Asia, Julian Lennon, ABC, Cheap Trick, Bruce Springsteen and Foo Fighters. The Mods & Rockers Show features Johnny Warman's Magic Bus, playing over two hours of classic songs by Mod and Rock artists, including The Who, The Rolling Stones, The Kinks, Jimi Hendrix, T. Rex, The Small Faces, Mott the Hoople, The Animals, Pink Floyd, The Beatles and Procol Harum. It follows Johnny and his band’s storming appearance at The Apex last July, with their Total Who Show. "Everyone who came will remember just how fantastic the night was," says Johnny. "We earned a standing ovation – and we're looking for a repeat performance with our Mods & Rockers Show." The Mods & Rockers Show starts at 7.30pm at The Apex on Thursday 20 July. 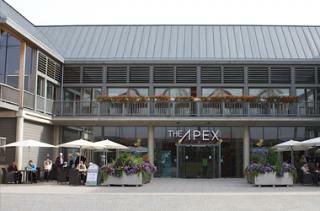 Tickets are £16, ring the Box Office on 01284 758000, or visit www.theapex.co.uk for more information, or to book your tickets.